As one of the most remarkable Formula One drivers of yore, Alfonso de Portago’s short life ended as abruptly as it bloomed, and featured a series of highlights that went way beyond motor racing. Alfonso de Portago’s father was a Spanish marquess, his mother a rich Irish lady, left with the fortune from her first husband. The family had connections with the crown of Spain, as King Alfonso XII was Alfonso’s godfather. The future Formula One racer was born into an abundance of wealth and possibilities for his life, both of which he throughly enjoyed using. He grew up London, before going to school in the south of France. Alfonso became articulate in four languages and learned to fly small planes. Before adulthood he was an adept flyer, and won a bet by flying his plane beneath a bridge. Some years later, while traveling in the USA, he met and married an American showgirl, with whom he had the two of his four children (their daughter, Andrea Portago, appeared on the cover of Andy Warhol’s magazine Interview). Shortly after, he illegally married a model in Mexico, and had an affair with an actress named Linda Christian. In the USA, Alfonso also met Luigi Chinetti, a three time 24 Hours of Le Mans winner, who was now working as a Ferrari importer. First, De Portago became Chinetti’s co-driver, but took over the wheel during the 1000 km Buenos Aires of 1954, promptly finishing second behind 1950 Formula One World Champion Giuseppe Farina. This instant success saw De Portage continue racing in Europe, and became known as ‘the two-car man’, as he often needed several cars to finish a race thanks to his ludicrous driving style. Brakes, clutches and transmissions often overheated or broke before the finish, and many cars were wrecked in his pursuit for speed and danger. He was quoted at this time as being a fearless driver, stating “I won’t die in an accident. I’ll die of old age or be executed in some gross miscarriage of justice”. 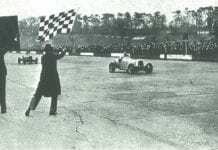 But Alfonso displayed the fact he had talent and went on to win six major races in quick succession, including the Tour de France automobile race. A man named Edmund Nelson, who he had also met in the USA, was his co-driver during this race, and it was him who introduced Alfonso to bobsleighing. Meanwhile, Alfonso also started as a jockey, competing twice in the famous Grand National at Aintree Racecourse. The venue was also used for motor racing, including the British Grand Prix, and Alfonso is the only person to have raced both horses and cars on it. Halfway the 1956 Formula One season — the year the Scuderia featured Peter Collins, Juan Manuel Fangio and Wolfgang von Trips — Enzo Ferrari signed the Spanish maverick to his race team. Alfonso retired in his debut race, the French Grand Prix, with a broken gearbox, but stood on the second step of the podium after British Grand Prix two weeks later, sharing the result with Collins. Retirements followed in the final two races. By the end of the season, Alfonso had already a new hobby: he started Spain’s first bobsleigh team. Together with his cousin he did a grand total of two practice runs, before buying a sleigh and showing up at the 1956 Winter Olympics. Unbelievably, he narrowly missed out on a medal by mere 0.16 seconds. Alfonso did however, win a bronze medal for Spain at the 1957 Bobsledding World Championship. Alfonso opened the 1957 Formula One season with points for a fifth place at the Argentine Grand Prix. A week before the second round of the calendar, the Monaco Grand Prix, the 25th (and eventually, the final) Mille Miglia was held in Italy. Ahead of the race there was fierce criticism on the safety of the drivers and spectators. De Portago entered, with Nelson continuing as his co-driver, in a Ferrari 335 S – a car capable of speeds of up to 300kph. Halfway during the race a mechanic discovered that the wishbone of the left front wheel was bent and the tire was scraping the chassis. Tools and a new set of tyres were brought, but Alfonso, desperate to win, drove on before the mechanics could return to complete the necessary repairs. Christian and De Portago, moments before disaster. Later, at a checkpoint in Rome, De Portago stopped alongside the course. Linda Christian, the actress with whom he was having an affair, ran through the crowd towards the car. The two gave each other one last kiss, before the Ferrari 335 S shot in motion and spurred away to destiny. Not much later on in the race, the left front tyre exploded, and the car, with Alfonso and Nelson in it, struck a telegraph pole and veered into the crowd who lined the streets. Alfonso and Nelson died instantly, along with nine locals, and along with them the historic race that was the Mille Miglia. Next articleWin A Chance To Work For Force India In Monza! Grand Prix POP – It's Podium or Pits!